So a few weeks ago, the Doctor got bored and decided to take the safeties off the TARDIS, and wound up turning a random childhood nightmare into a defining moment for young Danny Pink. And last week, he decided to endanger a whole school full of people, just to trap a monster that was on Earth due to the Doctor's own meddling. And then in tonight's "Kill the Moon," the Doctor first sets off young Courtney Woods by taking her into space and then telling her that she's nobody special, and then drags her to the Moon, at one of the most dangerous times in lunar history. (This is the other one.) And then, when the Doctor discovers the truth about what's happening on the Moon, he only tells the humans enough to freak them out — but not enough to reassure them. He then judges them for being freaked out. That's the thing about "Kill the Moon": The humans in this story only know what the Doctor tells them. And he chooses to give them an incomplete picture of the situation, one which leads the humans to take drastic actions. It's almost as if the Doctor wants to be able to judge us for our destructiveness and rash stupidity. Which is too bad, because the basic plot of "Kill the Moon" is actually a cool thought experiment: the Moon has been increasing in mass, causing havoc on Earth. (We're never told how many people have died, but presumably a lot.) And there are spidery parasite thingies, which turn out to be oversized bacteria. It turns out that the Moon is actually an egg, that's been gestating for a hundred million years, and now it's ready to hatch. In an hour or so. As it is, this story plays very much like the flipside of "Waters of Mars" — in both episodes, the Doctor shows up on another celestial body in our solar system at a crucial moment in human history. And in both stories, he saves a brave female captain from death. Like "Waters," this is a story that involves a fixed point in history, but in "Waters" it's one that must never be changed — whereas here, it's one whose outcome is unknown even to the Doctor. But in "Waters," it's the Doctor's willingness to meddle in human history that's the problem — here, he's not willing to meddle past a certain point. Threaded throughout this story is another really terrific idea — that in 2049, the human race has stopped going into space, because we decided there was no point. Some Mexicans went to the Moon in 2039 to set up a mining enterprise, but when they died mysteriously, humans gave up on space exploration. The neat twist on this is that what restores humanity's interest in space travel isn't being reminded of our can-do spirit, our ingenuity and so on — but having our sense of wonder recharged by seeing the beautiful creature emerge from the Moon, and not killing it. So presumably, if the human race got its way and killed the lunar creature, we'd have turned back to our inward-looking ways, with our fear of the unknown reaffirmed. That's a really cool spin on the "humans gave up on space travel" thing, and one I wish this story had done more with. So can the Doctor, having intervened countless times in human history, really decide to step back and abdicate? It's an interesting idea, but one that can probably never stick given the show's format. Can Clara really speak for the human race, here? (She could try taking another "lights on or off" straw poll from humanity, and then ignore the results a second time, I guess.) Does her injunction for the Doctor to stay away cover all of human history, or just the brief time when she's alive? In any case, the episode ends with Clara having a heart-to-heart with Danny Pink, who concludes that this is the time he warned her about last week: the time when the Doctor would finally push her too far. (Although this wasn't a matter of pushing her to do anything dangerous, or indeed ordering her to do anything — he was forcing her to decide things for herself.) Clara says she's done with the Doctor, but Danny insists you're never done with anybody as long as they can still make you angry. One thing you can't accuse Doctor Who of doing, this year, is playing it safe — the writers this year, including newcomers like Harness, seem to be doing their best to push the show's format to its limits and overturn our settled ideas of what a Doctor Who story should be about. The only trouble with that is that the Doctor, as active participant, is baked into the format — nobody's ready to go back to stories where the Doctor is a passive observer, or just wants to get back to his TARDIS. 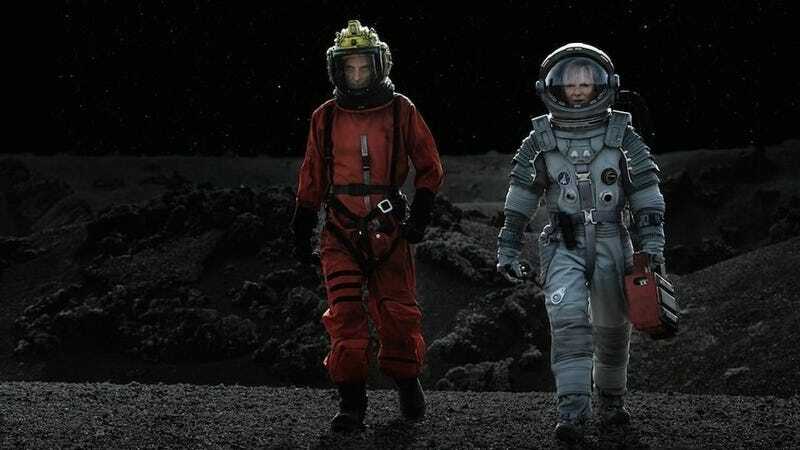 All in all, "Kill the Moon" is a neat idea for a story (despite some scientific plausibility issues) — but I'm not entirely convinced it works as a Doctor Who story. In fact, it might be a better story without the Doctor in it. As it is, in the context of this season, it seems to be another big step in the direction of turning the Doctor into an anti-hero and examining just how evil the Doctor can become, before he stops seeming like a hero. We're still delving into the question he asked at the beginning of the season: "Am I a good man?" Also continued this week: the theme of the Doctor condemning the human tendency towards paranoia and violence, as exemplified by soldiers. For now, the result is a more "alien," callous Doctor, reminiscent of Hartnell but also Pertwee and Tom Baker. But I'm more curious than ever to see where this is going.